This article contributes to scholarly understanding of how policy ideas and institutions interact to affect policy change by investigating why legislation mandating the use of biofuels in transport vehicles has been upheld in the USA but scaled back in the European Union. 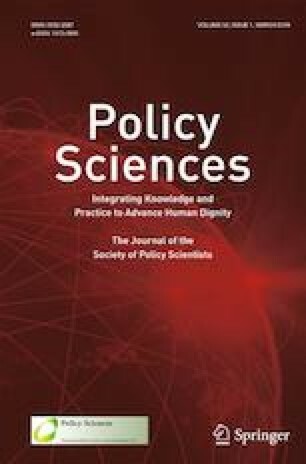 To explain this puzzle, the article advances propositions regarding the role of multidimensional policy ideas, policy anomalies and institutional gatekeepers in legislative agenda-setting. Using structural topic modelling and qualitative methods, the analyses demonstrate that differences in action frames follow from agenda-setting institutions. The corporate structure of the European Commission ensures that EU agenda-setters are reasonably attentive to policy anomalies. By contrast, individuals with agenda-setting authority in the US Congress are liable to discount anomalies by limiting their focus to certain aspects of multidimensional policy issues. Moreover, individuals with gatekeeping authority may prevent repeal bills from accessing the legislative agenda. Casinge, E. (2015). Parliament rubber stamps EU biofuels reform amid final controversy. Euractiv. April 29. Available at: https://www.euractiv.com/section/transport/news/parliament-rubber-stamps-eu-biofuels-reform-amid-final-controversy/. Commission of the European Communities. (2003a). Directive 2003/30/EC of the European Parliament and of the Council of 8 May 2003 on the promotion of the use of biofuels or other renewable fuels for transport. Official Journal of the European Union L, 123/42. Brussels. Available at: https://eur-lex.europa.eu/legal-content/EN/TXT/PDF/?uri=CELEX:02009L0028-20130701andrid=17. Commission of the European Communities. (2003b). Directive 2003/17/EC of the European Parliament and of the Council of 3 March 2003 amending Directive 98/70/EC relating to the quality of petrol and diesel fuels. Available at: https://eur-lex.europa.eu/legal-content/EN/TXT/PDF/?uri=CELEX:32003L0017andfrom=EN. Commission of the European Communities. (2009). Directive 2009/28/EC of the European Parliament and of the Council on the promotion of the use of energy from renewable sources amending and subsequently repealing directives 2001/77/EC and 2003/30/EC. Brussels. Available at: https://eur-lex.europa.eu/legal-content/EN/TXT/PDF/?uri=CELEX:32009L0028andrid=1. Commission of the European Communities. (2015). Directive (EU) 2015/1513 of the European Parliament and of the Council of 9 September 2015 amending Directive 98/70/EC relating to the quality of petrol and diesel fuels and amending Directive 2009/98/EC on the promotion of the use of energy from renewable sources. Brussels. Available at: https://eur-lex.europa.eu/legal-content/EN/TXT/PDF/?uri=CELEX:32015L1513andfrom=EN. Council of the European Union. (2014). Proposal on indirect land-use change: Council reaches agreement. 13 June. Available at: https://www.neweurope.eu/article/proposal-indirect-land-use-change-council-reaches-agreement/. Eisenstein, J., Ahmed, A., & Xing, E. P. (2011). Sparse additive generative models of text. In Proceedings of the 28th international conference on machine learning. Bellevue, WA. Retrieved from http://repository.emu.edu/machine_learning/210/. Hall, M. (2013). Parliament’s lead biofuels MEP in last ditch battle for ILUC recognition. Euractiv. September 11. Available at: https://www.euractiv.com/section/sustainable-dev/news/parliament-s-lead-biofuels-mep-in-last-ditch-battle-for-iluc-recognition/. Keating, D., & Simon, F. (2018). EU strikes deal on 32% renewable energy target and palm oil ban after all-night session. Euractiv. 14 June. Available at: https://www.euractiv.com/section/energy/news/eu-strikes-deal-on-32-renewable-energy-target-and-palm-oil-ban-after-all-night-session/. Taddy, M. (2012). On estimation and selection for topic models. In Proceedings of the 15th international conference on artificial intelligence and statistics (pp. 1184–1193). Ft. Lauderdale, FL. Retrieved from http://www.jmlr.org/proceedings/papers/v22/tady12/taddy12.pdf. United States. Department of Energy. (2018). Key federal legislation. https://www.afdc.energy.gov/laws/key_legislation. Accessed 15 July 2018.